This is Warren Vache at the top of his game long gone are the days when he attempted things that were beyond him, now he has the technique to achieve the notes that used to be unobtainable. All this plus an ideal partner on tenor saxophone, Houston Person plus a rhythm section which is ideal for this combination. If you are searching for a composer on which to base an album you need not look further than Benny Carter. In recent years other musicians are becoming aware what a fine composer he was and taking time to play and record his music. The album opens with “A Walking Thing” and the tempo is set by some well judged walking bass from Nicki Parrott followed by a nicely poised cornet solo by Warren full of twists and turns, Houston Person follows with some big toned tenor. The rhythm section purrs along with Tardo Hammer’s solo adding to the interest. “When Lights Are Low” gives Nicki Parrott a chance to display her vocal talents and it emerges she has a pleasant voice but there is nothing to set her apart from a host of female singers on the current scene. Warren adds a muted solo which adds to the mood of the piece. The beautiful “Evening Star” is Houston Person’s chance to display his ballad credentials and he does this with honours, pianist Tardo Hammer matches him all the way with a finely balanced solo, a performance to savour. Tardo Hammer is given the solo spotlight on “Summer Serenade” and he brings out the full beauty of the tune, he shares the spotlight with bassist Nicki Parrott who contributes a thoughtful solo. “Souvenir” is Warren all the way apart from a brief contribution from Tardo Hammer, Warren’s playing is beautifully controlled at a very slow tempo. The album closes with “The Romp” which it does just what it says on the tin with swinging contributions from all concerned. Mention must be made of drummer Leroy Williams who is immaculate throughout whether on sticks or brushes. 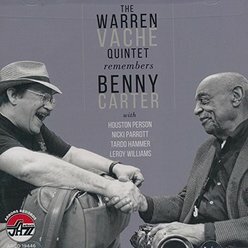 This is an album of great variety and some excellent playing from all concerned, plus the wonderful compositions of Benny Carter and comes highly recommended.